While in Auckland they will play three games against a club side and the Auckland Federation team. The team is made up of eleven Rarotonga based players and three players from the island of Aitutaki. This development tour is part of CIFA’s long term development plan for the preparation and development for future international events. The players in the development squad were drafted from clubs around Rarotonga and the Island of Aitutaki. Officials are Tahiri Elikana (Head Coach), Maryanne Miller (Assistant Coach), Elizabeth Harmon (Assistant Coach) and Moeroa Tamanagaro (Manager). 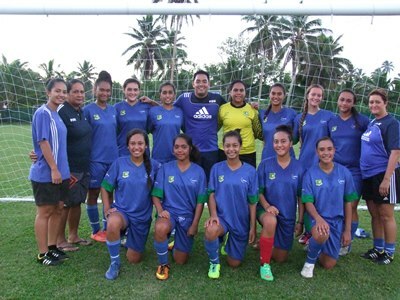 The Rarotonga based players are Moeroa Harmon, Kayleena Kermode, Rianna Pepe, Bermy Ariihee, Tearere Nikoro, Vanita Glassie, Kataraina Piri, Josie Miller, Memory Taripo, Kimiora Taulu and Paulina Morris-Ponga. The players from Aitutaki are Kathleen Enoka, Kate-Lory Mataiti and Nooroa Tuakeu.